2nd mortgage lenders continue to offer unique second mortgages featuring fixed interest rates on equity loans that are often taken out by homeowners to consolidate high interest debts and quick access to money for home remodeling, construction and more. We work hard to provide information on innovative second mortgage loans for all types of fixed rate refinancing. In most cases, homeowners choose fixed 2nd loans for debt consolidation and interest only credit lines for house repairs and emergency funds. Are you searching for a company that specializes in high loan to value second liens with not much equity required? Some of our 2nd mortgage brokers and lenders have earned recognition for offering second mortgage niches that are not matched by any other banks in the market today. We Have More Experience Connecting Homeowners with Second Mortgage Lenders than any other company online! For over a decade we have been connecting homeowners with industry leaders for high LTV second mortgages that allow first time homebuyers to qualify for loans without having any equity in their home. If you want to leave your 1st mortgage intact, but need cash out for debt consolidation, financing home improvements or buying a second home, then BD Nationwide is the perfect company to help you and your friends get more info about the latest and greatest second mortgages. As mortgage interest rates begin to rapidly increase, the popularity of a second mortgage has been increasing as well. How could that really be possible? When the majority of Americans have fixed rate first mortgages between 4% and 5%, then demand for second loans increases because there is no reason for refinancing the great loan. Find 2nd mortgage lenders that offer a wide variety of junior loans to help you maximize your home equity. There have been many new second mortgage products released in the last few months, so take a moment and complete the free loan request form above so you can discuss the possibilities of getting a 2nd mortgage that meet your financial goals today. The wide variety of second mortgage products are evolving with this finance friendly society called the "United States for getting cash out of your home." The bottom line is that people like quick cash, tax deductions, and the ability to refinance credit card debt. The rates on these types of loans are often as low as 1st liens. We can help you explore the best 2nd mortgage rates and subordinate financing solutions for tapping the equity of your home in order to completely understand how each type of 2nd mortgage serves the financing purpose of someone's unique position. We have a great reputation for leading homeowners to lenders that offer the lowest second mortgage interest rates online for multiple purposes. Our lending partners continue to provide both purchase and refinance opportunities with but 2nd mortgage programs have been called critically acclaimed because we offer unique opportunities to get money. If you are seeking a tax-deductible path when financing for cash back, a second lien is usually the best choice. Check with your tax advisor for eligibility and information with respect to tax deductibility guidelines and limitation on 2nd mortgage loans. A second mortgage is a loan against your property that is in addition to your existing 1st mortgage. This loan is secured by real property with a mortgage note used as an instrument for repayment. The 2nd loan is also known as a subordinate lien and home equity loan. The second mortgage is held and recorded in 2nd position on the property deed. If a borrower defaults on a 2nd loan the first mortgage lender is paid prior to the second mortgage lender when the proceeds are dispersed from foreclosure. In the past second mortgage loans have had a higher default ratio. Considering the risk factor added to these subordinate home liens, most mortgage lenders will charge a higher percentage of points (also called origination fees). In addition, the banks typically charge the consumer a higher interest rate than was offered with their 1st mortgage. Most mortgage companies require a 3-year pre-payment penalty with their 2nd liens. With most programs, Nationwide offers the borrower the option to not have an early payment penalty. Many consumers buying a house have used 2nd mortgages as tools to get zero-down home loans without having to pay mortgage insurance. Talk to your financing advisor about the pros and cons of using a second lien in place of a down-payment or paying PMI. BD Nationwide is proud to present the "Fast Fund" Second Mortgage Loan which requires no formal appraisal. The latest second mortgage program from Nationwide Mortgage Loans streamlines the funding process for home equity loans, because underwriting allows the use of an automated value model rather than a URAR or 2055 appraisal. Traditional appraisals require a licensed appraiser to visit, survey, and appraise a property and the comparable properties. In most cases, automated value models eliminate about 10 days of the home equity loan process by waiving the formal appraisal. The AVM accepted with these second mortgages takes the loan officer about twenty seconds to complete for most residences. BD Nationwide Mortgage offers a path for homeowners to find a second mortgage meeting each borrower's unique needs. Talk to lenders that offer choices for both open-end and closed-end second mortgages. Select from interest only, or principal and interest with lump-sum cash out loans with no equity required. You can consolidate credit cards with a second mortgage with terms ranging from 15-30 years. Leave your current home mortgage alone and get approved for a subordinate second loan with a fixed or variable interest rate. You can choose a subordinate loan with a fixed or variable interest rate. Our 2nd mortgage loan products offer you a competitive low rate with faster funding times and no mortgage insurance is required. We do not require you to pay closing costs out of pocket and often there is no appraisal is required. Bad credit refinancing has become more challenging but we assure you that our 2nd mortgage and refinance products are the most aggressive in the marketplace. Another option would be the home equity loan for people with bad credit. Let's assess your family's needs, and financial goals. How long do you plan to be in your home? The answer to that question may help determine your extent of borrowing. For example: Let's say your wife's employer offer her a great job out of state and you decide to make a family move, then you won't want to do a 125% loan. There is no reason to turn your equity upside down if you can prevent that problem by limiting your loan amount to keep you under 100% loan to value. You can still take out a 2nd mortgage; just wait until you have moved into the new house. There will always be people that tell you to get a mortgage refinance loan rather than taking a subordinate lien with an equity loan. We suggest discussing your needs with professionals, so you can make a sound financial decision. Let's analyze your considerations and research the different types of second mortgage liens. BD Nationwide strives to deliver an important message to households in every state. We challenge you to set your goals for obtaining personal fiscal responsibility. In mortgage terms, that would be translated as "Lock into a Fixed Rate mortgage!" Debt Consolidation Mortgage: Fixed rate loan with fixed monthly payments calculated with simple interest. This is a great opportunity to consolidate high interest loans and credit cards. Paying off the credit card balances in a second mortgage can have a profound impact on improving your credit scores. Learn more about leveraging your debts with a Low Rate Second Mortgage Debt Consolidation Loan. Let's say that you are interested in making some home improvements or would like a little bit of extra cash to take a dream vacation. If you have significant equity in your home, you can use it as leverage to get the money that you need. In most cases, you will face one of two options. You can either take out a traditional second mortgage and use the money as you see fit, or you can take out a cash out refinancing loan. A 2nd mortgage is a lot like cash out refinancing, but instead of refinancing your entire lien, you are simply taking out a loan against the equity that you have in your home. This allows you to keep your primary mortgage exactly as it is which might be a nice option if it is at an exceptionally low interest rate compared to what is available now. The biggest disadvantage of this particular course of action is that you'll find yourself with two monthly payments that you have to make. Most experts agree that, if the interest rate is 5% or higher, cash out refinancing typically makes the most sense. Rates for these types of loans are generally about one or two percentage points higher than traditional home equity or 2nd mortgage loans, of course the actual rate will depend on your credit score and credit history. A third option that you may want to consider is a home equity line of credit. A secured credit line is also a type of 2nd mortgage. This is basically like a credit card which allows you to borrow money against your equity and make payments back to your lender. If you have the loan paid off, you don't pay anything until the next time that you make a withdrawal. A line of credit is an excellent choice for individuals who want regular access to money without having to take out one large lump sum. The 2nd loan process can be exhausting, especially, if you haven't outlined specific goals. Every time you borrow money their needs to be a purpose that drives your loan. For example, if you are taking out a new second mortgage to pay off debts, like credit cards, then you must assert that the benefits significantly outweigh the risks. Itemize your goals with a 2nd mortgage before researching for the loan. Gather income documentation like w2's, 1099's, tax returns and paystubs. Shop online and compare quotes from multiple 2nd lenders. Have a professional review documents before making a long-term commitment. The primary reason why most homeowners consider paying off credit card debt by consolidating all of their outstanding credit debt into a second mortgage is because the interest rates on their existing credit card are simply too high. Stop throwing money away every month and take advantage of lower payment second mortgages. As you probably already know, banks issuing credit cards don't offer the same interest rate. You can get a lowered interest rate card, but it will probably be for an introductory term of 6 months or a year. The other area of concern is that the banks are allowed to change the terms at any time. If you were to transfer your credit card into a fixed rate second mortgage on a 15-year term, you would have specific, set terms that can't change for the duration of the second mortgage term. Another important factor is that each payment you make with a second mortgage goes towards paying off interest and principal. Many homeowners have circumstances arise that cause the borrower's credit scores to suffer. If you own a home and have some equity in your home, chance are you can save a pretty penny, by getting a second mortgage to wipe your debt clean. Even if your existing credit card have late payments, it's most likely still going to benefit you to consolidate your debt with a 2nd mortgage. Recently the underwriting guidelines for 2nd loan programs have become more lenient than ever before. If you have had a past bankruptcy, foreclosure, repossession, or have been late on your mortgage payments, you still may qualify for a fixed rate second mortgage. If your consumer debt is starting to concern you, and you are having trouble sleeping, it's time to consider your second mortgage options. If you are no longer able to make the monthly minimum payments in a timely manner, it's time to consider your options for a second mortgage that can lower your payments significantly and help your credit score increase. Eliminating the credit cards when you transfer the credit card debt to the second mortgage will help your credit score increase, because it is eliminating high revolving debt that is presently hindering your credit scores. In addition, making your 2nd mortgage payment on time every month will help your credit scores go up because the timely mortgage payments weigh heavy with fico scores. Dow Jones Business reported the Federal Reserve raised its key interest rate, its target for overnight bank lending, by a quarter point to 5% - the 16th increase in two years. In response to the hike, many major banks boosted their prime lending rates to 8%. Unfortunately, the prime rate and the funds rate spiked to their highest levels since spring 2001. In 2012, we have been blessed with the lowest interest rates ever recorded in the United States. This enabled 2nd mortgage lenders to extend credit lines and installment loans with rates at the 4% level. People are refraining from refinancing their existing liens, as they migrate towards 2nd mortgage loans instead. Typically, when interest rates start rising, 2nd mortgage loans become more attractive to homeowners that already have a great rate on their 1st mortgage. The rate-setting Federal Open Market Committee left room to raise rates again at its meeting in May. "Some further policy firming may be needed to keep the risks to the attainment of both sustainable economic growth and price stability roughly in balance," the Fed statement said. A key to what comes next lies in the health of the U.S. housing market. Some economists believe there is a risk that flat or declining home prices could crimp job growth and consumer spending later this year. Home financing has been the foundation of the economic recovery since 2001. We hope that with the no equity refinancing under the HARP program that property values will return to their level from a few years ago. According to Greg Robb, Fed officials have not sounded alarmed by the slowing housing sector. Gary Stern, the president of the Minneapolis Federal Reserve Bank, said in an interview with MarketWatch that the risks of a downturn in the housing market were exaggerated. Before the 80-20 loans came into the market-place, the default rates on 2nd mortgage loans were very low. It wasn't until second mortgages were introduced to purchase money transactions that defaults increased. Many people do not realize that traditional 2nd mortgage loans for the purpose of cash out or debt consolidation actually had a low default rate. As the housing market rebounds, you can expect to see some new home equity lending opportunities for qualified applicant's seeking a second mortgage. "I went online to learn of the qualification requirements on second mortgage loans. We had virtually no equity on paper, but they introduced us to several lenders that extended exactly the types of 2nd mortgage programs we were hoping for. " "I needed to reduce my monthly payments, and Nationwide helped us get approved for a loan that is saving us over $600 a month. Thanks for helping us get our finances back on track." "It was very difficult to find banks or lenders that approved 2nd mortgage loan amounts over $100,000. BD Nationwide enabled us to shop second mortgage companies without sale pressure. In the end, we found a credit line with a low interest rate and flexibility we were looking for with our house rehabilitation projects. Thank You!" "Within a few minutes we were comparing offers for 2nd mortgage loans online! We found a lender that provided us the extra money we needed and we didn’t have to refinance our 1st mortgage"
"We were searching for quick cash from a lender that did not require us to refinance our first loan. Fortunately, a friend referred us to BD Nationwide and they were able to help us locate a local lender that offered second mortgages at a reasonable rate of interest. Thanks for everything!" 2nd mortgage rates could be on the rise. 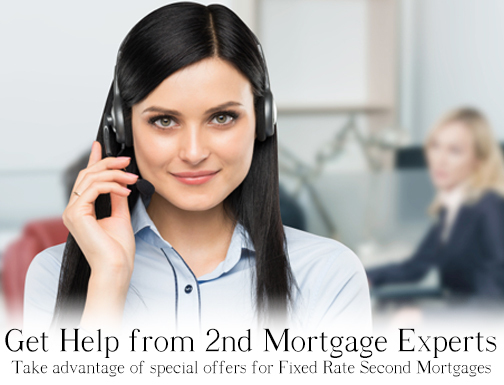 Find out today’s second mortgage rates and lock into a fixed rate loan that saves you money. Get updated interest rate changes for second mortgage loans online. Review the latest updated for loan guidelines for debt consolidation or cash out refinancing. 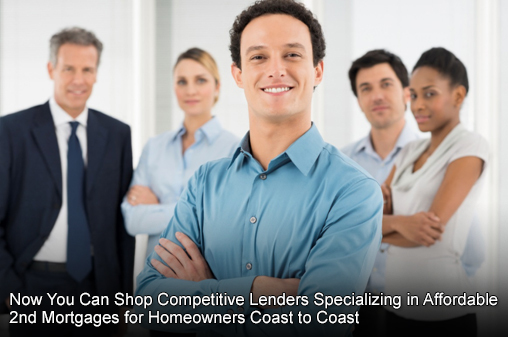 Second Mortgage Lenders - Compare New Incentives for qualifying homeowners. Simple Interest Second Mortgages - Fixed Rates are better for debt consolidation. - HARP offers refinancing with no loan to value restrictions. Need Help Getting Approved for a Fixed Rate Second Loan? - $200,000 second mortgage for qualified applicants. *Guidelines for reduced income documentation programs change frequently so check with lenders when shopping. - Variable or Fixed Terms? - Stated or Full Doc Loans? - Poor, Fair or Good Credit? Can You Get a 2nd Mortgage Behind Pay Option ARM Neg-Am Loan? Time may be running out for thousands of homeowners in Southern California, Florida, Colorado, Maryland, Connecticut and Washington DC. A few years ago when housing prices shot through the roof an estimated 50% to 70% percent of all home purchases used hybrid loans such as negative amortization and interest only loans (this program has been placed on hold). This website does not recommend interest only or negative amortization options. We suggest you speak with several loan officers from credible companies, in addition to your financial advisor. Take advantage of our free guides and disclosures that help 1st time homebuyers and people seeking more info on 2nd mortgage programs. Helpful Advice from the Leading 2nd Mortgage Lenders - We have assembled a team of loan originators, processors and underwriters that have significant experience in 2nd mortgages and equity loans to make the process easier on you. Did you know that in most cases, the IRS allows homeowners to deduct the interest on 2nd mortgage loans and credit lines up to $100,000? Check with a tax advisor to verify deductions that are applicable to your situation. Finance a New 2nd Home Today! After shopping online for a 2nd mortgage online for weeks, we found Nationwide. The delivered us a low interest equity loan quickly with less lender fees than their competition. We got approved for a $75,000 2nd mortgage at a great rate. We did not have to refinance our 1st loan, so we are happy our friend referred us to these 2nd mortgage lenders, because they delivered. After getting the "run-around" from our bank when we requested cash back, a friend referred us to Nationwide. We were pleasantly surprised to find out that a 2nd mortgage would provide us the funds we needed without requiring us to refinance the loan we have now. We needed a home equity line of credit to help finance the rehabilitation project we were doing on an investment property. BD Nationwide helped us secure a lender that extended a low interest credit line on our primary residence so we could remodel our 2nd home. Since I already had a 30-year loan fixed at 3.5%, I was reluctant to refinance but I need money to pay for some construction costs. This website helped me realize that second mortgage enabled e to get money without touching my 30-year mortgage. I qualified and financed all the construction projects that I needed help with. Thanks BD! BDnationwide simplified the shopping process when I was searching for an equity loan! Please note that this is not an advertisement for credit. Nothing on this site contains an offer to make a specific home loan for any purpose with any specific terms. This is a web-site and no second mortgage loans can be approved or guaranteed. Second mortgage rates are subject to change. BD Nationwide was affiliated with national lenders and a federally chartered bank located in Maryland licensed to offer mortgages in all 50 states. Copyright © 2001 and Beyond, BDnationwidemortgage.com is a website and cannot make loans. All rights reserved. Lending requirements may change without notice on the 2nd mortgage.